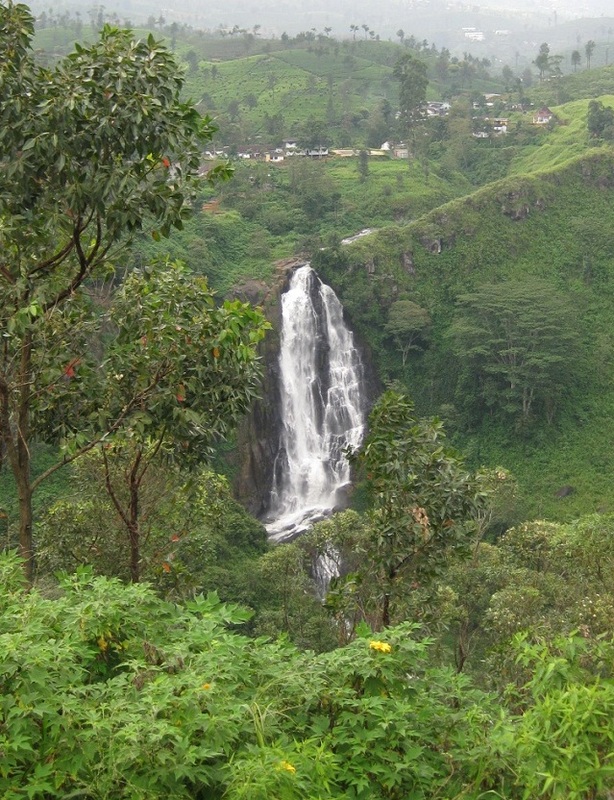 Devon is another famous waterfall in Sri Lanka. It is situated close to St. Clair Waterfall of Thalawakele. In fact like St. Clair, you can view this picturesque sight from A7 road (Avissawella – Nuwara Eliya). The fall is more than 300 feet high and it is formed of a tributary of River Mahaweli, known as Kothmale Oya. Wooo.. People are staying up there. Like staying in a heaven. Kirigalpoththa, Stunning! All the lush green and the rush of water... 300 feet! Heavenly ... Yes! It's one of the most beautiful waterfalls in Sri Lanka for me. Have you been to Devon tea centre as well? There, you can enjoy a nice cup of tea while absorbing the beauty of the waterfall. Thanks for your visit and for your kind words. It was good to have known your excellent Blog. I will return with more time to see everything you have here. That's quite a large waterfall! This is a beautiful waterfall -- one of the most impressive I've seen. You know how much I like waterfalls and I thank you for sharing this with us. What a beautiful area!! I love all of the angles in this capture. That has to be some kind of powerful force, with the amount of water spilling down! I imagine you could hear it from where you took the pic? btw: Those tall trees to the right of the falls are so gorgeous! Do you know what kind of trees they are? Oh it's so neat to come to your blog to see gorgeous waterfalls, K.... They make my heart go 'pitter-pat'... ha... I really love seeing all of your beautiful photos. Thanks SO much!!! Great capture of the fall. Scenic! love waterfalls. they are a great subject to photograph. you can get so creative with them. beautiful capture. hope all is well. so green, so lovely. Unbelievable. I've seen this fall from St. Clare tea center. Have you gone near the fall? the landscape is so inspiring, the waterfall amidst vivid green. Yes, it is 300 feet of one big water splash! I am not sure about Devon, Tea Centre. But I went to a super place called 'Mlesna' Tea Castle which had a great view of Devon. I had a good lunch there and bought some nice tea there. Also they had a mini hall full of exhibits related to tea industry. I knew you will like it. Yes, it is a grand waterfall! Yes, I could see the sound of splashing water from there quite well. It was a heavenly sight. Sorry, I have no idea of those trees, but yes they are quite nice. I'll let you know if I get more info about them. I knew this will be an interesting picture for you. I will try to show a closer picture of this one one day. Yes, waterfalls are photographer's delight. Every angle brings a total different picture. 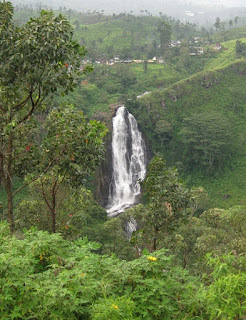 Yes, the greenery in this area multiply the beauty of the falls. WOW! Waterfall amidst dense greenery. A blissful monsoon sight! Yes, mostly because they are situated by the side of A7 main road and Kandy-Badulla railway line. Great shot, that looks like an amazing waterfalls. I also love to photograph waterfalls, in fact I recently went on a hike where there was one waterfall after another (although nothing like this one). Yes waterfalls are photographer's delight. What ever the angle or timing you get a good photo. This waterfall is a quite big one. But I also have found many smaller waterfalls during my hikes like you mentioned. Thanks for our comments. who is Devon named after? I had a student called Devon, and a fellow teacher whose surname is Devon. Waterfalls are always fascinating no matter where they are. And with this kinda height like 300 feet.. wow.. it definitely is a treat to the eyes. BTW if you've got a close up of this fall, don't forget to post it later. There is an estate nearby of that name, maybe the falls also got the same name. I can almost hear the water come crashing down! Glad you like it. Thanks a lot for your comments! !